Citimark Developers presents 114 sustainable condominium residences at the luxury 15 West North Vancouver condo tower. Located within the heart of the exciting and vibrant Central Lonsdale North Vancouver real estate corridor, the view homes and boutique residences that make up 15 West North Vancouver condos feature a locale that is close to everything you want to do outdoors: running, hiking, cycling, swimming, skiing, snowboarding and walking. Casual and fine dining, eclectic and boutique shops and a great array of amenities and local services are within walking distance from the new Central Lonsdale North Vancouver 15 West Condos for sale. And expertly designed, sustainably built North Shore homes for sale are inspired by the elegance of the area. Discover a new perspective right here at 15 West North Vancouver condos for sale, a collection of not only stunning, but affordable condominium units with picture perfect, sweeping views to the North Shore Mountains, Lions Gate Bridge, False Creek, the water and the downtown Vancouver skyline. 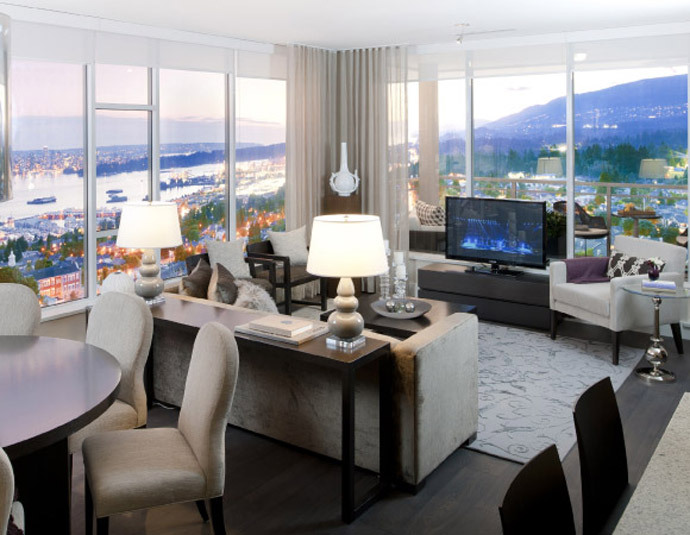 The Citimark 15 West North Vancouver condo tower is brought to you by an experienced team at Grosvenor, Citimark Developers and MAC Marketing. From the rendering, it looks like the North Shore high-rise tower will be about 18 storeys in height with a podium of two floors. 15 West North Vancouver Central Lonsdale condos are situated in one of the best North Shore districts and will offer high-end yet affordable condominium residences for a range of homebuyers. This high-rise district is close to all the amenities along Lonsdale Avenue in addition to major transit routes including bus and the SeaBus at Lonsdale Quay. In addition, the new North Vancouver 15 West Condos in Central Lonsdale will provide unparalleled harbor views across Vancouver downtown skyline to Burrard Inlet in addition to the North Shore mountains and the Lions. The architecture and design of the 15 West North Vancouver condo building is by IBI/HB Architects and blends natural ingredients and materials from local sources. The expansive decks and balconies as well as oversized windows of the high-rise Central Lonsdale North Vancouver condo tower will feature clean energy design and lots of built green features so that you save the environment as well as save energy and water at the same time. Hot water heating at the spectacular North Vancouver 15 West Condos is supplied by the local Lonsdale Energy Corporation and the building will also have storm water retention for irrigation, energy efficient appliances, water wise fixtures and green roofs. The building team at the 15 West North Vancouver Central Lonsdale condos for sale is by Grosvenor Americas and Citimark. All new home purchases come with 2-5-10 year home warranties in addition to extra security that includes a video enterphone system at the entryway in addition to key fob access per floor and to amenity spaces. There are storage lockers underground as well as secure parking. Club 15 at 15 West North Vancouver condos for sale will offer a social clubhouse lounge that includes a lush outdoor patio, comfortable meeting room for small and large gatherings, fully equipped fitness area, wet bar and seating area. The podium garden on Level 2 of the 15 West North Vancouver condo tower in Central Lonsdale neighbourhood will have benches and tables, a community garden, children’s play area and BBQ area for outdoor entertainment during the summer months. The 15 West North Vancouver condo entrance will have a reflecting pool in addition to a lobby that has expansive windows and seating lounge. The Central Lonsdale 15 West North Shore condo tower will feature expansive balconies and/or decks with gas outlets to create more living space throughout the year. In addition, the kitchens are designed for you in mind with functional and spacious layout that incorporates more coutner top space and storage areas. All homes will come with a premium KitchenAid Architect Series appliance set in stainless steel finishing and includes an efficient slide out hood fan, quiet and energy efficient dishwasher with front panel for a clean and integrated look in addition to a Chef’s wall with microwave and convection oven. Other stainless steel appliances at the 15 West North Shore condos in Central Lonsdale North Vancouver real estate market will include a powerful five burner gas cooktop, and a full sized fridge with bottom freezer and water dispenser. The kitchens will also have double under mount sinks, Grohe faucets from Germany, pull out veggie spray and garburator. The 15 West North Shore condos for sale will also feature thick single slab granite counters and granite backsplash, engineered cabinetry wood finish, under mount halogen lighting and soft closing drawers and doors. The beautiful bathrooms at the Central Lonsdale 15 West North Shore condos for sale will incorporate oversized porcelain tiled floors, recessed pot lights and shower light in addition to low flow dual flush water conserving toilets and Acri-Tech deep soaker tub with walled surrounds. Some homes will have framless glass shower stalls with ceramic tiled wall surrounds and engineered wood cabinets with full counter width mirror and cabinet storage. There are limestone or marble counters in the bathrooms at the 15 West North Shore condos in Central Lonsdale neighbourhood as well as sleek undermount sinks with Danze wall mounted chrome fixtures that are Euro style. Also, the 2nd and 3rd floors have unique floorplans, many of which have terrace decks. These range from 1 bedroom to 2 bedroom plus den layouts. Discover 15 West North Shore Condos Today! Discover what you’ve always wanted in a place you’ve always loved. Experience 15 West North Shore condo tower that features beautifully designed condominium residences that site atop a natural ridge in the heart of the ever popular and highly sought after Central Lonsdale North Vancouver real estate district that has plenty of upside in the near and long term future. The new 15 West North Shore condo tower offers stunning views and panoramas in addition to access to countless neighbourhood amenities and local services/conveniences. Centrally located, the Central Lonsdale North Vancouver 15 West Condos for sale will be just seconds away from Lonsdale Avenue with all of its great restaurants, shops, boutiques, coffee stores, banks, retailers and green spaces. Plus, you are just 15 minutes away from the local mountains and even closer to the waterfront. Discover 15 West North Vancouver condos today and find superior standard features inside and the elegance of this new neighbourhood that has been revitalized. 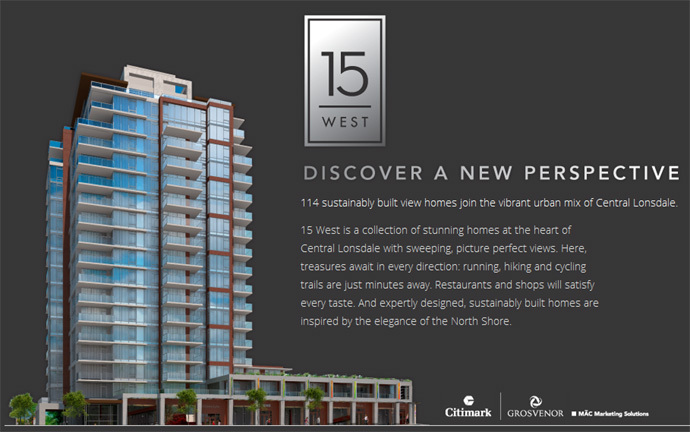 15 West North Shore is coming soon, so please register your interest today at www.15west.ca for VIP Launch details and more. The Citimark/Grosvenor project is located at 144 West 15th Avenue North Vancouver and is being advertised by MAC Marketing Solutions. If you haven’t visited the 15 West Condos in North Vancouver Discovery Centre yet, you’re missing out on the North Shore’s most spectacular combination of views, comfort and convenience. 15 West North Van condos for sale has been open “by appointment only” for the past month and we are well on our way to a successful Grand Opening on January 28th. With so many people choosing to make 15 West North Shore home, the end of 2011 was a busy time for us. We’re looking forward to continuing our current success and hope that you will come and see what sets 15 West Condos in North Van real estate market apart from our competition. We are excited to be working with Citimark and Grosvenor on their 18 storey tower at 15th Street and Chesterfield in Central Lonsdale North Vancouver real estate district. The views are amazing and are paired with high quality finishings and construction. 15 West North Shore condos for sale will be unveiled soon! Coming Soon: Discover what you’ve always wanted in a place you’ve always loved. 15 West North Shore condominiums in Central Lonsdale real estate district is coming soon to Chesterfield and 15th Street. Beautifully designed North Shore 15 West condo homes sit atop a natural ridge in the heart of Central Lonsdale. 15 West North Vancouver offers stunning views and access to countless amenties plus a superior standard of interior elegance new to the neighbourhood. 15 West Northshore condos will feature stunning views from downtown to Vancouver Island, the North Shore mountains and the urban vibrancy of the Lonsdale corridor and beyond. Matching the views of 15 West Northshore condos will be our comfortable and impressive home plans and interior design. Everywhere you look at the Central Lonsdale 15 West condo tower will impress you. 15 West Northshore condos is located at 144 West 15th Street in North Vancouver’s Central Lonsdale community. We’re just off Lonsdale; close enough to all the amenities and conveniences but far enough from the activity and noise. Thank you for your interest in 15 West North Vancouver Condo Tower. We’re getting very excited as we get closer to the opening of North Shore 15West condos and finally be able to introduce you to a new level of finishing in North Vancouver Central Lonsdale real estate district. 15 West North Van condos will showcase stunning views of the downtown core, over to Lions Gate Bridge and beyond to Vancouver Island and continuing to sweep around to the North Shore Mountains. Keep an eye on the 15West North Van condo website for floor plans, views and more features of these amazing homes. Featuring a wide selection of 1 bedroom and 2 bedroom homes, plus an exclusive selection of 3 bedroom homes, the North Shore 15West condos for sale is sure to impress you. If you’re in the area this weekend don’t forget to take a stroll down Lonsdale and experience the amazing retailers and services just steps from 15 West North Van Central Lonsdale condo tower. Shop at Kerrisdale Cameras, North Shore Ski and Board or Brazza Gelato and Coffee and enjoy all that living just off Lonsdale has to offer. THE AUTUMN MONTHS HAVE BEEN GREAT AT 15 WEST! WE’RE FAST APPROACHING OUR GRAND OPENING THIS JANUARY! We’ve had the privilege to welcome so many people into the 15 West North Vancouver Condo Discovery Centre since we started previewing this amazing community to people like you that have registered early. The response has been unanimous. “Beautiful… Amazing views… Luxurious interiors…” and so on, even before our North Shore 15 West condo Discovery Centre was complete. Now we have a fully finished Discovery Centre and Show Home and are very close to opening to the general public. We want to make sure that you’ve had a chance to visit us and learn about this stunning 15 West North Shore condo building, located just off Lonsdale, before everyone else. With access to the core of Central Lonsdale’s amenity rich environment, life at 15 West North Vancouver condo tower will be so convenient. Best of all, the access to Lonsdale is close enough to walk but at North Shore 15 West you won’t have to live within the busyness of it all. 15 West Central Lonsdale Condos is a quick stroll to the rich collection of Lonsdale’s energetic shops and services. Since you’ve expressed interest in 15 West North Van Condos well ahead of our Grand Opening, we’ve released a select VIP Collection of homes for you to choose from. Regardless of the type of home you’re interested in or the specific outlook of stunning views, we can offer you almost any combination of size, view and price range. But hurry, we’ve already sold half of our VIP Collection. Please call me today at 604-764-9420 to arrange your personal tour and see for yourself why 15 West Condos in North Vancouver is unmatched on the North Shore. The 15 West Condos Discovery Centre is located at 144 West 15th St North Vancouver, BC.